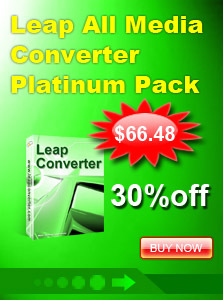 Leap All Video Converter Platinum is an all-in-one video converting tool with easy-to-use interface, fast converting speed and excellent output video quality. It allows you to effortlessly convert video files between all popular video formats, which can help you convert AVI, WMV, MPEG, MP4, ASF, VOB, 3GP, iPhone, MOV, FLV to AVI, MP4, WMV, VCD, SVCD, DVD, 3GP, iPod, iPhone, Zune, Xbox, PMP, PSP, Apple TV, Pocket PC, FLV, SWF, and MOV video formats. 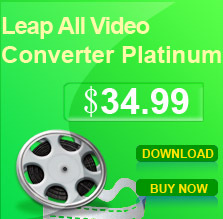 It owns all the functions of Leap video conversion series.